A few weeks ago, I spent a busy Friday running errands, chauffeuring the kids to and from after-school activities and birthday parties, and Girl Scout meetings. It was a crazy Friday afternoon. The girls had planned to stay overnight at a friend's house, and the Hubs and I had plans for a date night. When I got home after dropping the girls off at their sleepover, I realized I had little to no time to get ready for dinner. We didn't have reservations, so we weren't tied to getting out of the house at a certain time. But, hey, we are old folks, and after my busy day, I knew I'd fade fast if I were out much later than 11 pm. I didn't have time to shower or to make a major outfit change. What did I do? Well, I converted my favorite green jeans from day to night. I am living in my green jeans lately. One of the things I love about colored jeans is their versatility. Perfect for a casual day, but easy to dress up for evening. For my daytime look, I had a striped boat neck top, flats and a canvas tote paired with my green jeans. I love to wear navy, gray, white, and black with my green jeans. And I really love a casual striped shirt with them. For evening, I wore a glittery tank, a black boyfriend blazer, added a long necklace, a snakeskin clutch, and some black, pointed toe heels. After adding some mascara and a bolder lipstick, and I was ready to go. I just wished I had taken a picture of myself. At the time, I never thought I'd write a post about it. Now I know better...always snap a pic! 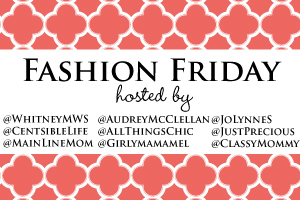 For more fashion inspiration and to see what everyone else is wearing, head over to Musings of a Housewife for Fashion Friday!